Adam Lambert fan as well. When I first heard Lambert sing, I immediately thought he would be a perfect fit for Queen. 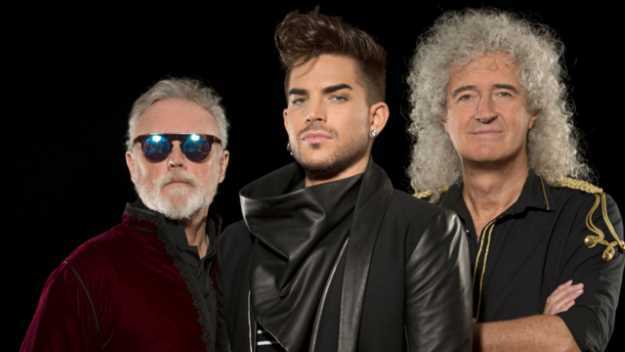 Lo and behold, Adam has been working with and touring with Queen since 2012. Lambert met Queen for the first time on the eighth season finale of “American Idol” in 2009. Lambert came in second place to Kris Allen. Adam should have won; don’t know what happened with that vote. Lambert may have lost on Idol, but he certainly came out the overall winner. What a dream come true, to work with Queen, one of the best rock bands from the ‘70s and ‘80s whose music is still heard on the radio today. 8:45. Every minute after that was just amazing. The music was perfect and although Lambert didn’t try to imitate Freddie Mercury, the lead singer who died in 1991, he was spot on with his vocals, exposing his own flair. Lambert actually told audience that he could never fill Freddie’s shoes and he wasn’t trying to — but he noted how lucky he was to perform with the legendary progressive rock band and that he was a fan, too. This experiment was very successful. Prior to Lambert taking the lead vocals, Paul Rodgers, of Bad Company, was singing lead for Queen from 2004-2009. I am more than positive that that was a wonderful music marriage. However, Rodgers doesn’t have the vocal acrobatics of Mercury and Lambert. Lambert, 35, has a decade of experience in musical theater where he probably gained most of his flamboyance. The set on stage looked like an old huge oil tanker that you see on the Turnpike in Elizabeth. A thunderous bass drum would shake the container and signify that the show was about to start. The robot from Queen’s 1977 “New of the World” album appeared to open/crush the oil tanker. The audience went wild when he appeared, including me. The anticipation was uncontrollable waiting for the show to finally get going. sang it in its entirety later in the show. Everyone sang along — not just to that song, but every other song going forward. The stage was designed into the shape of a guitar. The body of the guitar was where the drums, keys, bass, guitar were and where Lambert would stand to perform. They used the neck of the guitar to walk, strut, run, dance and even ride a bike on for the song “I Want to Ride My Bicycle.” They also used it for the drum battle that would occur later in the show as well. Adam’s costume changes were appropriate for each song. Black leather for “We Will Rock You” (leather was a Freddie thing). His costume change for the encore, “We Will Rock You” and “We Are the Champions” was silver lamay with dangling women’s earrings and a crown. Lambert commanded the stage as if he and Queen had been playing together since Queen’s inception. You could definitely see the camaraderie amongst the band. And Queen’s background vocals were impeccable, one of the few rock bands that have excellent background vocals. 68, and of course on lead vocals, Adam Lambert. To get that perfect sound, they incorporated keyboardist Spike Edney, bassist Neil Fairclough and percussionist Tyler Warren. All of their most popular songs were performed with the exception of “Best Friend.” “Killer Queen” was performed on a 6-foot head of the robot from “News of the World,” which rose from a trap door in the floor. “Under Pressure” was performed by Lambert and Taylor. Taylor sang David Bowie’s verses and it was perfect. The drum kit also rose from the stage and they sang it on the neck of the guitar. May sang acoustically to “Love of My Life” alongside the superimposed image of Mercury. It appeared they were singing a duet side by side. It was very emotional since most of Queen’s songs were torch songs from a man hiding his sexuality. I Want to Break Free, Somebody to Love and believe it or not Bohemian Rhapsody. Bohemian Rhapsody has had different meanings to a lot of different people but if you want a lyrical analysis you would see that a lot of their songs were about Freddie’s struggles and quest to find true love and happiness. “Fat Bottom Girls,” “Another One Bites the Dust,” “Who Wants to Live Forever,” “Crazy Little Thing Called Love,” “Radio Ga Ga,” “I Want It All” and so many more songs were performed to fill this two-hour plus set with no break in between. Since he did a solo on acoustic guitar that gave everyone a break and of course a moment for another costume change for Lambert. Then for Brian to take a break, they had the drum solo/battle between Taylor and Warren. The drums were mic’d perfectly. The bass drum replaced your heartbeat. Later, Brian would then do a guitar solo in which he was elevated at least 100 feet or more into the air from the stage. Keeping Queen’s spirit alive, this tour was unforgettable. All of their great songs were performed with accuracy. Lambert was not imitating, but infusing his vocal influence was great. They even threw in one of Lambert’s songs, “Two Fux.” Wish they did “Whataya Want From Me,” instead, but “Two Fux” was just as good. So with the five costume changes and amazing special effects from Quantum Special Effects the evening was explosive, especially when floor cannons shot shiny gold mylar confetti into the air that spanned across the entire audience. There was a plethora of special effects, the lighting which for the most part was synched to the music and a lot of smoke. Speaking of “Bohemian Rhapsody,” no one at the time of its release ever thought it would make it on the radio never mind becoming an anthem. Record label execs claimed it would never amount to anything since it was six minutes long.